On December 29, 2017 former Mayor Kasim Reed announced that the City of Atlanta had signed letters of intent for a $100 million expansion of both Piedmont Park and the Atlanta Botanical Garden. The expansion consists of 2.94 acres and has formally moved forward with the $19 million purchase of land on May 25. The land purchased is located at the corner of Piedmont Avenue and Monroe Drive and is currently home to the Clear Creek shopping center. Some initial artwork of design concepts for both portions of the expansion have been released on the City of Atlanta website. The design will be developed by HGOR, a landscape architecture and planning firm. Funding for the project will come from two sources. The first $20 million was provided by the city government, with funds coming from TSPLOST, Atlanta BeltLine Inc. and the Department of Parks and Recreation. The remaining $80 million will be acquired through a philanthropic effort to obtain private funds. The City of Atlanta Department of Parks and Recreation (DPR) has also been integral in the expansion plans. Amy Phuong is the Commissioner of the City of Atlanta DPR who has been working on the project. “We have over 500 amenities, which range from a tennis court to an outdoor pool to a recreation center,” Phuong said. “But many of our assets are passive public spaces.” One of the largest of those spaces is Piedmont Park. “Our partners are at the Piedmont Park Conservancy and Atlanta Botanical Gardens, and we have regular check-ins all the time,” she said. As a team, the inspiration for the park and garden’s expansion came from all parties. Phuong looks forward to the expansion process but also acknowledges the attention to detail necessary. “Piedmont Park is our central park so being strategic about how we acquire space is critical,” she said. “As Atlanta continues on the path of urban development, the DPR attempts to retain the important aspects that parks provide. Phuong has a few key strategies for making the project possible and a few ideas about what could go into the expansion as well. “We are going to be working with our partners and the community to decide on designs,” she said. Overall, this expansion provides the resources necessary for the city of Atlanta and the DPR to reach their goals. 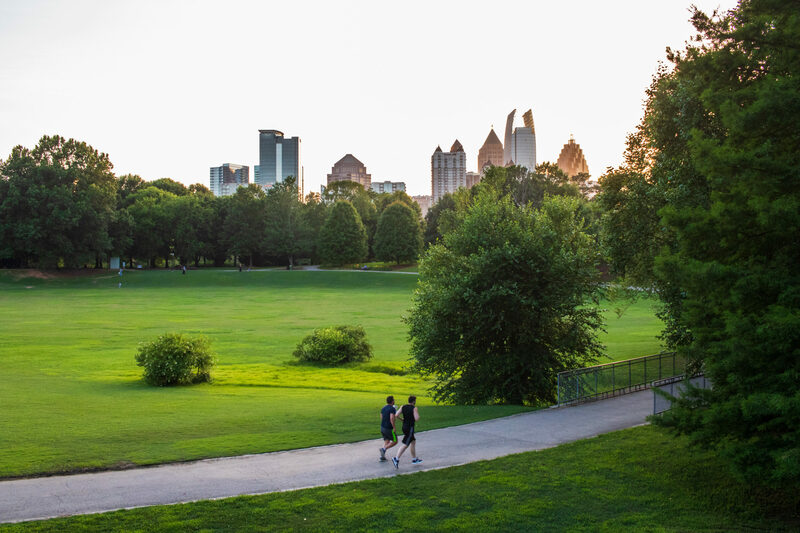 Piedmont Park is 211 acres in size and attracts over four million visitors each year. It is open year-round and free to the public. The Piedmont Park Conservancy is a nonprofit organization which has partnered with the City of Atlanta for the expansion project. Dietrich notes that the Conservancy is a key player in the expansion plans as well. “In the expansion, we play the role of mentor, advocate, community involvement, and fundraising partner,” she said. Dietrich repeats the statements of Phuong from the DPR, seeing the opportunity as one to improve the park in ways that the community needs most. “In regard to specifics, the Piedmont Park Conservancy will facilitate a public input process to help determine the expansion’s new features and amenities,” she said. Dietrich includes the careful thought process the Conservancy puts into the details of the project. “Having more space allows for more opportunity. The expansion will also mean that Piedmont Park becomes more accessible to those on the north side, and will help spread out the density of visitors,” Dietrich said. The last main party in the expansion is the Atlanta Botanical Garden which was founded in 1976 and consists of 30 acres dedicated to plant collection for conservation, display and research. It is home to two nationally recognized conservation programs and the largest orchid collection in the country. Mary Pat Matheson is the President and CEO of the Atlanta Botanical Garden who discussed what the expansion means to her and the garden. While there are many steps in the process before finalization on the feature of the expansion, Matheson has a vision for the expansion that she is fairly certain will be reality. “We have been doing a lot of work in Atlanta because we do so much with native plants, to make sure the plants around the whole southeast region remain healthy in their ecosystems and their habitats,” she said. For Matheson, this core value of conservation has a vital element that needs support. This focus is important for Matheson, in that it serves the environment as a whole. She expanded on the specifics of this concept and how butterflies will play a large role in a new amenity. Matheson said that through testing, they know this is something the visitors want to see in the garden. All parties in the expansion are thrilled at the opportunities available. “I think it’s going to be spectacular,” Matheson said.